Fire crews have extinguished a huge blaze on moorland in West Yorkshire. The fire, described by one witness as "apocalyptic", started at about 19:30 on Tuesday and covered about 1.5 sq km of land near Marsden. 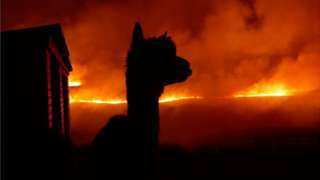 West Yorkshire Fire and Rescue said it was "one of the biggest moorland fires we've ever had to deal with". You can read more about how the blaze was tackled and its impact here. This is the aftermath of one of the largest moorland fires West Yorkshire has seen. Fire crews worked hard throughout the night to tackle the blaze on Marsden Moor last night. Firefighters on Marsden Moor tackled flames which were two metres high last night in what the fire service says one of the biggest moorland blazes the county has ever seen. Crews arrived at about 20:00, where there about four sq km of moorland were already on fire. By 03:00 the fire had died down, but teams will remain at the scene for the majority of today to monitor the situation. Station Manager Adam Greenwood said: "It was one of the of the highest flame fronts we have seen with flames of up to two metres high and it was moving fast across the moorland. "The quick initial fire attack by firefighters did help to bring the fire under control, despite the size and ferocity of the flames." The Duke of York has thanked fire crews and police officers for their work throughout the night to control a blaze which took hold of Marsden moor. Crews remain at the scene to ensure it does not reignite. Firefighters say the huge blaze was one of the biggest they have "ever had to deal with". Residents who live in the area surrounding the scene of one of West Yorkshire's biggest moorland blazes have been told to stay indoors following last night's fire. The fire, on Marsden Moor, started at about 19:30 and burned through the night before fire crews from West Yorkshire and Greater Manchester brought it under control early this morning. Station Manager Adam Greenwood said crews had "worked tirelessly to get the fire under control and have done a great job". "The fire looks to be out, however moorland fires can easily reignite so it’s important that we monitor it closely," Mr Greenwood added. Meanwhile, Public Health England has advised residents to stay indoors and keep doors and windows closed. A spokesperson said: "Motorists who have to travel through the smoke should keep windows closed, turn off air conditioning and keep their air vents closed." A fire which swept through a mile-long stretch of West Yorkshire moorland has been put out this morning after burning through the night. Fire crews spent the night at the scene of the blaze near Marsden. They were called out at about 19:30 yesterday evening and remain on site this morning, with volunteers from the National Trust, which owns the land. The Incident Commander described it as "one of the biggest" fires they've ever dealt with. Andy Rose, from West Yorkshire Fire Service said the 45-minute trek to the frontline of the fire made it difficult to get water to the flames, so fire crews had to use beaters. Five pumps and two wildfire units remain at the scene this morning and they're expected to stay there for much of the day to tackle any "hotspots". The flames spread over 1.5 sq km of moorland near Marsden. These are the latest pictures from the scene of a major fire on moorland near Marsden in West Yorkshire which "now looks to be out", according to West Yorkshire Fire Service. Crews were called at about 19:30 last night, with the Incident Commander later describing it as "one of the biggest" moorland fires they've ever dealt with. At its height about 35 firefighters were on the scene. Five pumps and two wildfire units remain there this morning, according to the fire service. They're expected to stay there for much of the day to tackle any "hotspots". A major fire on moorland near Marsden will have a serious effect on heather which has just re-grown after a previous blaze, the National Trust has warned. The fire broke out at about 19:30 yesterday evening and West Yorkshire Fire Service said it was one of the worst fire crews had ever witnessed. Mike Elliot, from the National Trust, which owns the land, says: "The heather had only just got re-established after a fire about three years ago. "It's gradually got back to its normal self, but unfortunately it's going to have to start again." Fire crews and National Trust volunteers are expected to stay at the scene of the fire for some time to come. Fire crews from West Yorkshire and Greater Manchester have spent the night at the scene of a major blaze on moorland near Marsden. They were called out at about 19:30 and remain there this morning, alongside volunteers from the National Trust, which owns the land. A major fire on moorland near Marsden in West Yorkshire "now looks to be out", according to West Yorkshire Fire Service. Crews were first called to the scene of the blaze at about 19:30 last night, with the Incident Commander later describing it as "one of the biggest" such fires they've ever dealt with. At its height, five crews from West Yorkshire and two from Greater Manchester - a total of about 35 firefighters - were on the scene. I'm at the scene of a large fire on moorland near Marsden in West Yorkshire where, in the last hour, firefighters have made a lot of headway - but I'm told the blaze is far from out. The fire, covering almost a mile of moorland, broke out at about 19:30 last night and throughout the night fire crews couldn't continue to fight it because it wasn't safe to do so in the pitch darkness. It's very difficult terrain to fight a fire in, because the heather catches fire and the flames then get into the peat underneath, travel along, and pop up elsewhere. But a lot of progress is being made here compared to the scene we saw overnight, where one resident who'd never seen anything like it described it as "apocalyptic". Andy Rose, from West Yorkshire Fire Service, told me the 45-minute trek to the frontline of the fire was causing problems. He said getting water to the flames is very difficult because of the terrain, so they are currently using beaters. I've heard they may later use helicopters to "water-bomb" the remaining burning heather. Fire crews have been at the scene since about 19:30 yesterday after the fire broke out at the scene. The blaze is now under control, according to West Yorkshire Fire Service and firefighters and volunteers are expected to remain at the scene throughout this morning. 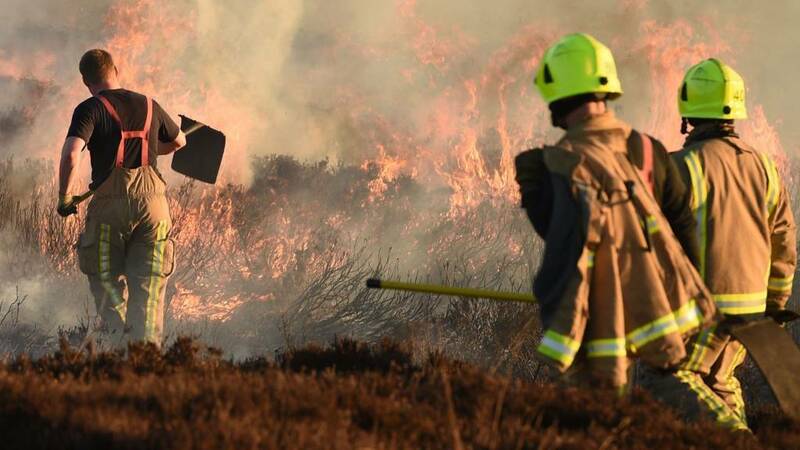 Video caption: Fire crews from West Yorkshire and Greater Manchester are tackling a moorland blaze.Fire crews from West Yorkshire and Greater Manchester are tackling a moorland blaze. Fire crews from West Yorkshire and Greater Manchester are tackling a moorland blaze. I'm at the scene of a large fire on moorland near Marsden in West Yorkshire. The fire covering almost a mile of moorland broke out at about 19:30 last night and throughout the night fire crews couldn't continue to fight it because it wasn't safe to do so in the pitch darkness. But now dawn has broken, crews are back on the scene. It's about a 45-minute walk to get to the frontline of the fire, so it's not easy to get to, especially with heavy equipment. At the moment firefighters with beaters are on the moor doing their utmost to try to extinguish the flames, but they don't know how long it will take to completely put the fire out. Speaking to one witness last night at the major fire on moorland near Marsden, they said: "Imagine what the world would look like when it's ending - this is what it would look like." You could see the glow for miles around, with flames leaping into the air. People normally in bed came out specially to witness this at first hand. There was a smell of smoke in the air, but it wasn't not too bad visibility-wise. Volunteers from the National Trust will help firefighters at the scene of a huge moorland blaze this morning, the fire service has confirmed. 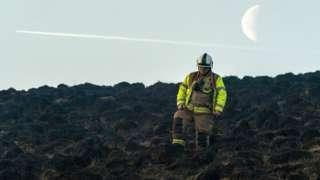 Incident Commander Laura Boocock, from West Yorkshire Fire Service, says the blaze, which covers just under a mile of land on Saddleworth Moor owned by the National Trust, is under control, but volunteers are needed to help contain it. Crews and resources will remain on scene near Marsden until it's totally safe, she adds. At its height, five engines from West Yorkshire and two from Greater Manchester were on scene. Fire crews tackling a huge blaze on Saddleworth Moor in West Yorkshire say it is under control. The fire started at about 19:30 on Tuesday and covers about a mile of land near Marsden. One witness described the blaze as "apocalyptic". The A62 between Colne Valley and Diggle was closed for several hours in both directions as a precaution. This is the latest from the scene of a large fire on moorland near Marsden in West Yorkshire. Fire crews have been on the scene overnight dealing with the blaze, which began at about 19:30 yesterday evening and covers about a mile of land.